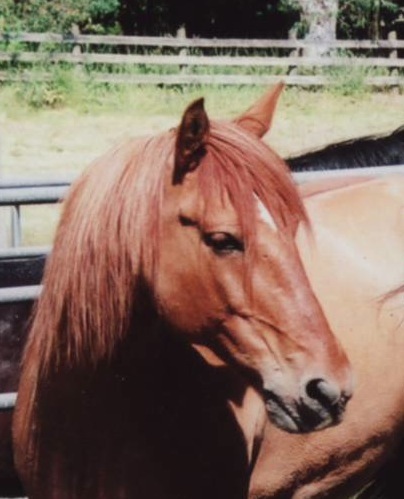 When I brought home my jumpy, suspicious, depressed mustang I thought, “ By this time I know all the right things to do—this will be a piece of cake.” I soon found that he couldn’t care less what I could ‘do’ with him. He would do it, all right, but his heart and spirit were missing. In the end I found that just standing with him—watching geese fly down the creek, listening to our neighbor call her cat in for the night, untangling his unruly mane with my fingers—was what won him over. Now he enjoys the work I have to offer him, and I always feel enriched from spending time in his world. Are We Human ‘Beings’ or Human ‘Doings’? Horses sometimes appear to watch the humans around them with wonder. We’re always doing: grooming, feeding, talking on the cell phone, cleaning paddock or saddle, tacking up, exercising, working, chatting with other people, planning future events, even petting and nuzzling, asking for affection or appreciation. We may strive to do two or three of these things at once. Horses, on the other hand, always seem to have time to just hang out. If we join them are we wasting time or gaining something special? This morning I went out and stood with my mare in the misty rain, under the barn overhang by her stall, and enjoyed changing my 21st century human attitude (dreary day) to feeling how the horses were taking in the gentle rain, soft aimless bird calls, feeling of the world settling into winter, nothing to do about it or complain about… so satisfying and calming. Our daily world has noise, visual excitement, speed and action, and we often bring it into our horse time. What if we stopped now and then to be in our horse’s world—standing and breathing, taking it in? What is she looking at in the barn or pasture, feeling under her feet, around her ears, on her coat? What kind of sounds does she hear in her neighborhood? From the tiny mouse flitting along the stall walls to the people who feed, who lives in her community? In many cultures people pause at sunset to contemplate or give thanks for the day. Outdoor animals often are quiet and still for a few minutes as the day ends, and night begins. It’s a good time to share a few moments of peace with your horse. But anytime will do. At sunrise you might see a cat sitting in the mist across a gopher hole with the farm dog. If you were quiet enough, would you hear the California poppies opening to the sun? Or you can take a quick break on a summer afternoon and see parent swallows, one on each side, escorting their young ones on first flights; watch lush new tree leaves tossing in the wind. Even a peaceful evening has entertainment to offer: vultures floating toward their roosts; summer bats flitting and swooping in the dusk; Great Horned Owls courting from darkened treetops in fall; winter geese honking through moonlit clouds. One of my favorite sunset memories was looking across the outdoor paddocks to see a lone stable helper give someone’s horse a hug after putting on his blanket. I like to watch weather from a horse’s viewpoint. There’s all sorts of rain—misty, showery, pouring, windblown. After a few times, you may start to notice (as the horses do) how every storm or weather change has a different feel to it. Once I was in the barn when a thunderstorm blew in. I expected the horses in the pasture to rush to join me where I huddled under the roof. Instead as lightning crackled on the low hills all around, thunder boomed and the air filled with ozone, they grazed serenely on. Just 3 minutes makes a difference.Try being. Explore your horse’s world. Major benefits guaranteed. Do you feel safe standing with your horse? Does your horse need help feeling safe in the world? or safe with you? Every horse is affected by the behavior and presence of the people around him. Rescue or rehab horses may need extra care and patience as they learn how to leave behind the fear or pain from their past. With any horse begin at least an arm’s length away so the horse can see you clearly. If it feels safer, lean on the fence outside. If you want to be closer, pause a little distance away until you are sure your horse knows you’re there. Then come and stand beside the neck or shoulder, keeping your head behind the horse’s head and far enough away not to be hit by a fling at a fly or a start at sudden noise. Stay aware of where your feet are (not beneath the horse’s is best). Keep your voice quiet and your movements slow and smooth. There’s nothing to do, though, but slip into your horse’s world for a little while.